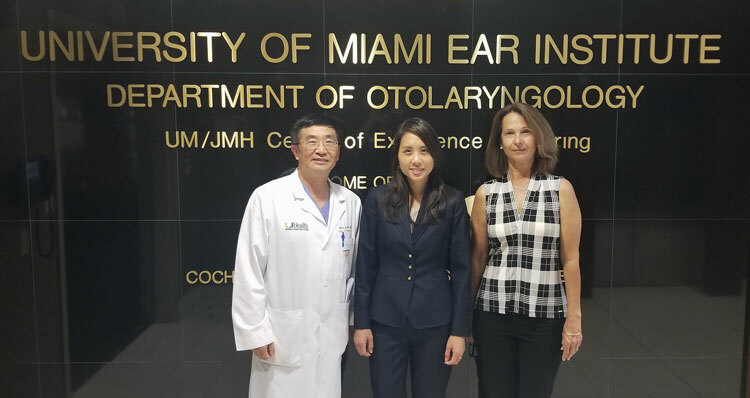 The University of Miami Miller School of Medicine Department of Otolaryngology received three research grants from the National Institutes of Health (NIH) to fund research related to developing new therapies for patients with neurofibromatosis type II (NF2). From left, Xue-Zhong Liu, M.D., Ph.D., Christine Dinh, M.D., and Cristina Fernandez-Valle, Ph.D.
NF2 is a hereditary tumor disorder that affects one in 33,000 children and young adults nationwide and predisposes these individuals to develop multiple nervous system tumors — particularly bilateral vestibular schwannomas (VS) — that can cause profound hearing loss, disabling imbalance, and life-threatening intracranial complications. Two of the grants fund a joint collaboration between Xue-Zhong Liu, M.D., Ph.D., professor of otolaryngology, human genetics, biochemistry, and pediatrics at the Miller School, and Cristina Fernandez-Valle, Ph.D., professor of neuroscience, at the Burnett School of Biomedical Sciences at the University of Central Florida’s College of Medicine. The National Institute on Deafness and Other Communication Disorders (NIDCD) approved $3.1 million for five years through the R01 grant, while the National Institute of Neurological Disorders (NINDS) funded a $350,000 R56 grant for one year. The third grant is a prestigious K08 physician-scientist training grant awarded to Christine Dinh, M.D., assistant professor of otolaryngology at the Miller School, under the mentorship of Drs. Liu and Fernandez-Valle. “The K08 award will help us define the mechanisms of how VS causes hearing loss in NF2 and develop novel therapies to preserve hearing in these individuals. Hearing loss in NF2 affects patient safety, understanding, communication, and quality of life,” Dr. Dinh said. With these new grants, the two teams will conduct comprehensive preclinical testing of the effectiveness of Food and Drug Administration (FDA)-approved drugs on mouse and human merlin-deficient Schwann cell lines, primary human VS cells, and in a xenograft model of VS. Researchers will also define the role of tumor genetics and epigenetics on the expression and secretion of proinflammatory cytokines and the development of HL, which are essential steps towards establishing personalized treatments for NF2. NF2 is caused by a mutation in the NF2 gene that codes for merlin protein, which leads to the development of a number of nervous system tumors. In particular, NF2 patients develop benign tumors of the cochleovestibular nerves, which are important for the transfer of auditory stimuli and balance information from the inner ear to the brain. The condition can also cause tumors to grow around the brain and spinal cord. Although most NF2 tumors are benign, as they grow they can compress important neurologic structures that can lead to hearing loss, dizziness, facial paralysis, and other intracranial complications from brain and brainstem compression. Treatment of NF2 patients often includes microsurgical resection of tumors by specialized surgeons; however, due to the location and nature of these tumors, surgery often results in permanent neurological deficits, such as deafness and facial paralysis. Radiation therapy has also been used to prevent the continued growth of tumors, but radiation can also promote the progression of hearing loss and increases the risk of malignant transformation of tumors in this NF2 population. Currently, there are no FDA-approved drug treatments for NF2. However, some NF2 patients have demonstrated some tumor response and hearing improvement to certain chemotherapies, such as bevacizumab (Avastin). Fernandez-Valle and her team have created mouse, human and patient-derived Schwann and schwannoma cell lines, optimized their use in high-throughput assays, and conducted multiple screening campaigns in collaboration with NIH/NCATS, Sanford Burnham Prebys and Torrey Pines Institutes. Several promising scaffolds are being modified. A faster route to NF2 therapies, however, is repurposing cancer drugs that target relevant pathways. “NF2 is a devastating disease. As a neurotologist, I recognize the value of the approaches undertaken. The research and awards are very timely and important, and I am very pleased to initiate and introduce our research and clinical NF program,” said Fred F. Telischi, M.D., MEE, chairman of the Department of Otolaryngology and professor of biomedical engineering and neurological surgery at the Miller School. The UHealth Ear Institute is a multi-disciplinary program that provides comprehensive diagnostic and therapeutic options for NF2 patients and their families. Information about the institute’s work is available here.